Ian Utley is the author of the travel guide book Culture Smart Ghana. His article below though is not a Ghanaian travel log, nor does it concern itself with the rich Ghanaian culture. It’s a harsh uncompromising look at the lack of vision and direction in Ghana’s tourism industry. That said, read…. Undoubtedly, Ian Utley cares. He’s lived here for a long time, learnt Twi, the lingua franca of Ghana, and has immersed himself in Ghanaian life. He sees that tourism in Ghana does have a lot of potential to make Ghana better.The tone of the article,I believe, is one of blatant scathing exasperation. I’d venture to guess that this is the result of being ignored and perhaps avoided. How frustrating when you can’t get a foot in the door to present such a common sense argument that it takes like-minded tourism professionals to guide tourism for like-minded tourists. On a macro level, all this relates directly to my firm belief that development-be it of a tourism industry or a nation- is dependent on people, not money. Development will come only when foreign expertise comes and Ghana’s diaspora returns in their numbers bringing their newly acquired talents, skills, and like-mindedness. Whatever, I’m sure Ian Utley won’t stop throwing stones. And who knows others might join him. 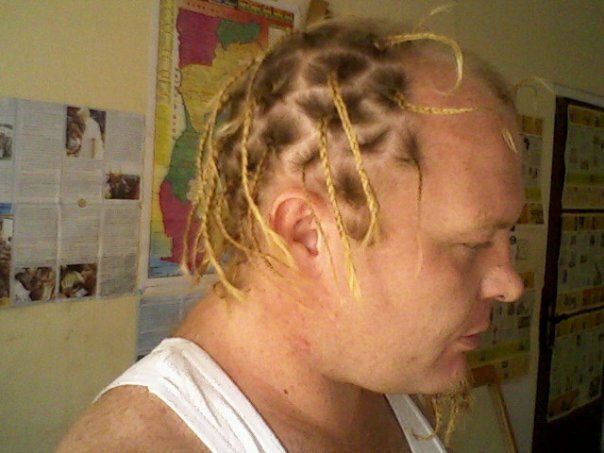 Madinghana celebrates his guts and his spirit, not leaving out his brains, under that unique hair style. hee hee…. ← KUMASI METROPOLITAN ASSEMBLY REVISES HOTEL LICENSES DOWN! Thanks for this post; I want to meet this guy! It is frustrating for sure. Not surprising though. I do feel that things are improving. Simple things like the service at the STC is better than 5 years ago. That’s not saying much, but I believe it will improve in time, particularly as the benefits become more obvious to all and more people benefit directly.